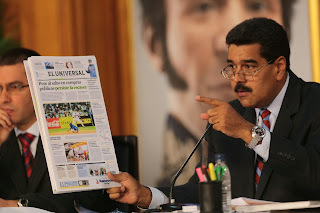 The strategic plan to destabilize Venezuela has the primary goal of debilitating the government before the December 8 municipal elections, as revealed in the document: “The objectives put forth in the present plan are essentially geared towards the municipal elections set for December 8, while at the same time including the accelerated deterioration of the government, facilitating an opposition victory for this event...” Though the text states further, “...but if it could be done beforehand, that would be even better”. The document also details the strategy to sabotage the electrical system in Venezuela, with the objective of blaming the government for a weak infrastructure and therefore projecting an image of crisis in Venezuela on an international level. As part of the plan, the authors propose, “To maintain and increase the sabotages that affect public services, particularly the electrical system, that will enable responsibility to be placed on the government for supposed inefficiencies and negligence”. For the past few months, blackouts and other electrical shortages have affected different regions throughout Venezuela, causing general discontent and reflecting negatively on the government. Just weeks ago, Venezuelan authorities detained various individuals involved in sabotaging the electrical system and at the end of September, President Maduro expelled three US diplomats from the US Embassy in Caracas for their alleged role in destabilization plans against the state. In the section labeled “Actions”, the authors of the document detail their next steps to undermine the Venezuelan government. In addition to “Perfecting the confrontational discourse of Henrique Capriles”, the opposition candidate who lost to Maduro in April’s presidential elections, they also talk of “Generating emotion with short messages that reach the largest quantity of people and emphasize social problems, provoking social discontent. Increase problems with supply of basic consumer products”. Throughout the year, Venezuela has experienced problems with the supply of basic products, such as toilet paper, sugar, milk, oil, butter, flour and other food staples. Venezuelan authorities have confiscated tons of these products illegally held inside warehouses belonging to opposition businesses. They have also captured large quantities of these items on the border with Colombia, where they are sold as contraband. According to the document, “The Strategic Venezuelan Plan, agreed upon by representatives from the opposition to the government of Nicolas Maduro, is oriented towards these objectives with the strong and constant support of various world figures who aim to return Venezuela to the true democracy and independence, which has been kidnapped for more than 14 years”. During the 14 years of President Hugo Chavez’s democratic governance, threats against his administration were abundant and destabilization plans never ceased. After the failure of the 2002 coup d’etat against Chavez, which was defeated by his millions of supporters and was organized by the US government, there were numerous attempts to oust him through economic sabotages, electoral interventions, assassination plots, psychological warfare, multimillion-dollar funding to opposition groups from US agencies and a plan to isolate Venezuela on an international level, that never had success. One of the most visible faces of attempts to subvert Chavez’s government was ex Colombian president Alvaro Uribe. The former Colombian head of state ended his presidency in 2010 calling for international intervention in Venezuela in order to destroy Chavez and his Bolivarian Revolution. Uribe has dedicated himself since then to difame Chavez and his legacy, as well as strengthen his ties to anti-Chavez groups inside and outside Venezuela. The death of Preisdent Chavez in March 2013 didn’t stop Uribe from continuing his actions against Venezuela. With the election of Nicolas Maduro to the presidency and the continuation of the socialist process initiated by Chavez, Uribe has mantained his agressive agenda against Venezuela. Now this internal document, a product of a meeting between the extreme right-wing in Colombia and Venezuela, together with representatives from the US government, proves the active destabilization plans against Maduro. As part of this dangerous plot against Venezuela, the authors propose to “Create situations of crisis in the streets that will facilitate US intervention, as well as NATO forces, with the support of the Colombian government. Whenever possible, the violence should result in deaths or injuries”. Venezuelans, representatives of the opposition, are working together with foreign interests to generate deaths of innocent citizens in their own country, with the objective of justifying a military invasion in their nation. This represents a grave threat – and a vile crime – against the sovereignty of Venezuela. Furthermore, in addition to promoting an international campaign to marginalize, discredit and tarnish the Maduro government, the document recommends “a military insurrection” against the Venezuelan state. They propose, “contacting active military groups and those in retirement to amplify the campaign to discredit the government inside the Armed Forces...It’s vital to prepare military forces so that during a scenario of crisis and social conflict, they lead an insurrection against the government, or at least support a foreign intervention or civil uprising”. This document evidences and confirms the veracity – and the severity – of the accusations made by President Nicolas Maduro. Venezuela is under attack, as it has been throughout the past 14 years since the beginning of the Bolivarian Revolution and the recovery of Venezuela’s sovereignty, independence and dignity. Let us not forget that Venezuela has the largest oil reserves on the planet. The powerful interests that seek control of those resources will not stop until they attain their objective.